This Porsche 911 Carrera is in immaculate condition as you can tell from the pictures and I highly recommend you inspect it for yourself to appreciate its fantastic body condition. This car has a powerful 3.6 litre engine. A truly superb car that really stands out in a crowd. This car has front & rear power windows, central locking, front fog lamps and premium sound system. Equipped with ABS brakes. This car has been certified as roadworthy. This car has climate control air conditioning. PERFORMANCES FEATURES Equipped with ABS brakes. This Porsche 911 Carrera 1990 has central locking, front & rear power windows and premium sound system. This car has a powerful 3.6 litre engine. Last but not least this car has climate control air conditioning and front fog lamps. It comes with a complete roadworthy certificate.,, This vehicle will add to any collectors prize possession! Unmarked red paint, all original C2 Carrera. 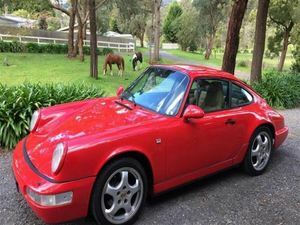 If you want to own the last of the air cooled 964 Porshe this is it. Racing pads, heavy duty clutch and motor rebuild 10k ago.